Hahn was instrumental in leading VW into China. Given its status as the world's largest auto producer, China has the economic might to dominate the EV industry, Hahn said. Hahn made his comments Thursday at the Seoul Forum, a conference hosted by the Seoul Economic Daily newspaper. Hahn was instrumental in leading VW into China through a joint venture with Shanghai Automotive Industry Corp. that launched production in 1985. 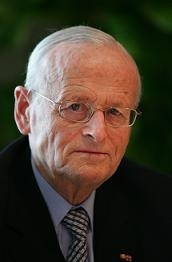 Hahn was chairman of VW's board of management from 1982 until 1993, when he retired. China is turning to electrification in part to reduce its growing dependence on imported oil. Chris Flavin, president of the Worldwatch Institute, told the conference. "If China used as much oil per person as Japan, which itself uses half as much as in the United States, you'd have to double world oil production." Hahn predicted electric and hybrid-electric vehicles will be limited to 10 percent of the global market until 2030. After that, he said, technical advances will allow electrification to spread. Increasing urbanization favors electrics, he said. In 2008, for the first time, the majority of the world's population lived in urban, rather than rural, areas, he said, citing data from the United Nations Population Division. On the other hand, he said that the beneficial environmental effects of electrification depend on the energy used to create electricity. Today's vehicles, powered by gasoline or diesel, emit fewer than 100 grams of carbon dioxide per kilometer traveled. Hahn compared that level of CO2 emissions to that from a compact car that uses 16 kilowatt hours of electricity to travel 100 kilometers -- and adjusted for the way the electricity is generated in each specific market. An electric vehicle in the European Union would indirectly emit 89 grams of CO2, and one in Japan would emit 96 grams, Hahn said, citing VW data. In the United States, the numbers would be slightly worse: 123 grams. But for China, with its vast array of coal-fired generating plants, the number would jump to 179 grams. And for India, the CO2 emissions would be even higher, at 247 grams. China's heavy reliance on coal to generate electricity could neutralize the environmental benefits of an EV fleet. This debate gains urgency when one considers the rapid growth of China's auto production. Last year, China passed Japan to rank first among countries in vehicle production with 13.8 million units, Hahn said. Japan was second with 7.9 million, followed by the United States with 5.7 million, Germany with 5.2 million, Korea with 3.5 million and Brazil with 3.2 million. Predicts Hahn: China will rank first among all nations in vehicle production "for the rest of this century, until India overtakes it."